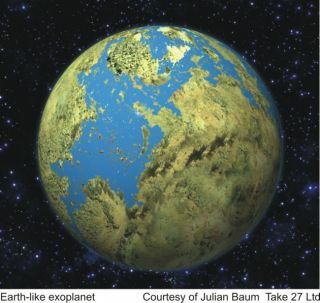 An artist's impression of an Earth-like planet. Nobody knows if there are any for sure, however, or what they might look like. New computer simulations of known extrasolar planetary systems suggest about half of them could harbor an Earth-like world, mathematically speaking. All of the known planets orbiting other Sun-like stars -- there are at least 130 -- are very massive, most similar in heft to Jupiter. Earth-sized planets, if any exist, can't be found with present technology (with the exception of a handful discovered around a dying star). But several models by different groups have shown rocky planets about the size of Earth could exist in known systems where a giant planet orbits a Sun-like star. In the new work, researchers created hypothetical giant planets and found that each creates two disaster zones -- one inside its orbit (closer to the star) and one outside. A fledgling Earth in either zone will either be lured into a collision with the larger planet, will hit the star, or will be tossed out to the cold, dead, far suburbs of the system. That's no surprise. But the specifics of the model bear attention: The disaster zones are governed by the giant planet's mass and the eccentricity of its orbit, or how noncircular it is. "The larger its orbital eccentricity, the greater the gravitational reach of the giant," said Barrie Jones, an astronomy professor at the Open University in the UK. The question was this: What sort of system with a large planet can support a rocky planet in a habitable zone, the region where temperatures are favorable for allowing liquid water to exist on an Earth-sized planet. "If liquid water can exist, so could life as we know it," Jones said. Other researchers caution that the presence of water does not mean life necessarily exists. Nobody knows how life begins or whether it has gotten started anywhere beyond Earth. But rocky, wet planets are a great place to start looking for biological activity. To allow an Earth-sized planet in a stable orbit within a habitable zone, the giant must either be well outside that zone, as Jupiter and the other giants are in our solar system, or well inside, the modeling found. "The more massive the giants the further their perturbing gravitational reach, and the more distant from the habitable zone they need to be," Jones told SPACE.com. "You can't be too near a giant or its gravity will wreak havoc with the 'Earth' orbit." This is where the modeling gets interesting. The scientists then applied these rules to real planetary systems. Several of the known extrasolar setups involve a "hot Jupiter," a planet roughly the mass of Jupiter in a very tight orbit around its star. These worlds see a year go by in less than a week. The computer-generated disaster zones, particular to each actual star and its giant planet, were compared to that star's habitable zone to see if there were any safe havens -- stable orbital routes within habitable zones. When the computer model was run, about half of the known systems allowed a safe haven over a long enough time period, including into the present, to possibly allow life to evolve, the researchers found. A few other systems had habitable zones in the past or will have them in the future as their stars age and energy outputs change. Toss these in and the researchers come up with about two-thirds of the 130 systems they studied harboring habitable zones at some time in the past, present or future. The research was to be presented today at the National Astronomy Meeting of the Royal Astronomical Society. Open University researchers Nick Sleep and David Underwood contributed to the work. Scientists do not expect to discover Earth-sized planets until a new generation of space telescopes, such as NASA's Kepler mission, fly later in this decade.